I found out about this book due to the happy accident of stumbling upon the website of the SCBWI (Society of Children’s Book Writers and Illustrators) Tokyo Translation Group. It’s a fantastic site that has taught me a great deal about Japanese children’s literature, and I’m grateful that it’s so well organized and contains so many interesting and well written essays. Naoko Awa (1943-1993) was an award-winning writer of modern fairy tales. She was born in Tokyo, and while growing up, lived in different parts of Japan. As a child, Awa read fairy tales by the Brothers Grimm, Hans Christian Andersen, and Wilhelm Hauff, as well as The Arabian Nights, which later influenced her writings. She earned a bachelor’s degree in Japanese literature from Japan Women’s University, where she studied under Shizuka Yamamuro (1906-2000), who translated Nordic children’s literature into Japanese. While still in college, Awa made her literary debut in the magazine Mejiro jidō bungaku (Mejiro Children’s Literature). 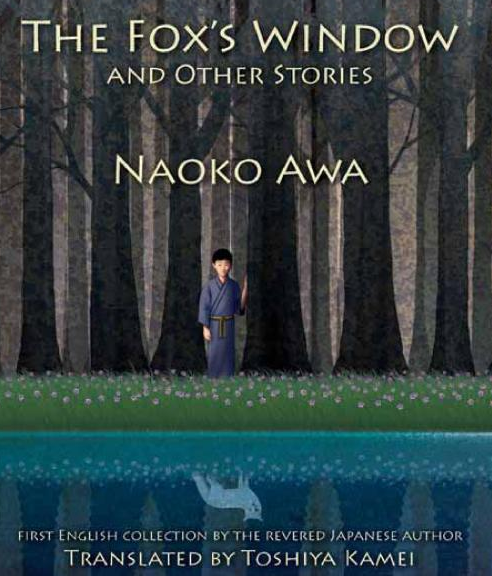 The themes of Awa’s work collected in The Fox’s Window are nature, transformation, and bittersweet pain of fondly remembered past. Like Western fairy tales, Awa’s stories are filled with animals who possess anthropomorphic attributes, such as the ability to talk. Like Classical mythology, Awa’s stories operate on at the edges of a constantly shifting boundary between plant, animal, and human; flowers can easily turn into girls, and rabbits and can easily turn into boys. In the worlds Awa creates in her writing, charming and innocuous trickster spirits abound and good deeds are always rewarded. This childhood realm is seldom presented without nostalgia, and characters often remember the past as being more vibrant than the present. After a short while, the blind girl married the young man. She became a happy wife who knew the true color of the sky better than anyone else. Even after her hair turned white, she enjoyed watching the sky in her rocking chair. In my mother’s vegetable garden, a patch of shiso plants was getting soaked by the drizzle. I wondered if she would come out into the yard to pick the leaves. A soft light seeped from the house. From time to time I heard children’s laughter mixed with the music from the radio. The voices belonged to me and my sister, who was now dead. I gave a deep sigh and dropped my hands. The house I grew up in burned down, and that yard doesn’t exist anymore. The Forest of Voices returned to silence and waited for its next prey. It was a terrifying place. Countless animals had lost their way in the forest. Like someone scared of his own reflection in the mirror, every animal going astray among the trees was surprised by its own echo and ran in circles until it collapsed and died. Sometimes humans wandered into the forest – hunters pursuing their game and woodcutters following the wrong path in the fog. They all ended up nourishing the oaks. Such stories always end well, though. The pure of heart always prevail and no one is ever really punished. The only characters who die or get hurt are animals, and even then it’s usually just an instance of the “dead mother” trope. Unfortunately, this lack of darkness made the stories seem shallow to me. With no true shadows or bursts of light, the separate stories began to blur together into a sepia-toned slurry of adorable children, talking animals, and nature imagery. These stories are completely harmless and thus, in my opinion, mostly forgettable. Perhaps The Fox’s Window would appeal to parents of young children for whom the stories of Beatrix Potter and Jill Barklem are deemed too scary. The stories might also appeal to the children themselves, as younger readers have an astonishing ability to make up details to fill in the gaps of minimalist narratives. Since the visual imagery of Awa Naoko’s writing is so strong, her stories might also appeal to artists and illustrators looking for inspiration. In fact, I felt that each of the individual pieces in The Fox’s Window was highly impressionistic, like a pencil sketch of a scene onto which a single layer of watercolors has been quickly applied. Although this type of writing doesn’t hold a great deal of appeal for someone like me, who finds beauty and meaning in words and narratives, I imagine that Awa’s short fairy tales could be much more interesting to someone better able to think in pictures and images. I’d like to thank University of New Orleans Press for making The Fox’s Window available on the Kindle Store. I’ve been noticing a baffling dearth of children’s literature in digital format, and I think it’s wonderful that this collection is helping to remedy the situation.